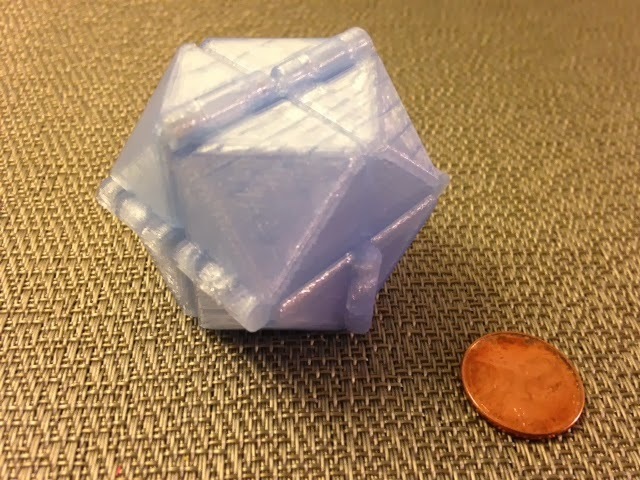 Today we finished our customizable print-in-place fidget cube model. By changing just a few parameters in OpenSCAD code, we can decide whether the fidget cube will have a snub configuration (as shown below), set the sizes of the blocks and the hinges, and fine-tune the clearance between moving parts. It still amazes me that this model can print in place, all in one piece, with functioning hinges - especially since during the print some of the hinges are horizontal while others are vertical! Settings: Replicator 2 with MakerWare .2mm/standard in about an hour and a half. In addition to looking cool, the snub sides reduce the print time by about 30 minutes and save some plastic. We used a custom profile to get linear fill instead of hexagons. No raft or support are needed! Customizer settings were as follows below (although I suggest setting hinge_clearance lower for future models). UPDATE: Featured on 1/29/2014 as Thing-of-the-Day by AlexHuff at 3dideaform.com. UPDATE: From this post by Kevin Osborn on the Ultimaker forum, I learned that you can pick up prints of my fidget cubes at the MakerBot retail store!